The university is fully residential. Banasthali Vidyapith released the Admissions notifications for the academic year 2019-20. Banasthali Vidyapith Higher Education Admission 2019 for various graduates and post-graduation courses is now open. 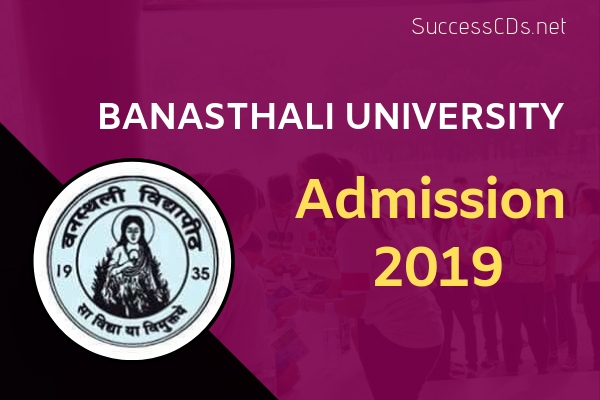 Candidates may apply online for Banasthali University Admission, details for which has been given below. Banasthali University offers Elementary Education (Nursery to class VIII), Secondary School Certificate (IX & X) and Senior Secondary School Certificate (XI & XII). Class 11 and 12 admissions are available in field of Humanities, Sciences and Commerce. For obtaining prospectus and application form, send a DD/IPO for Rs.800/- in favour of "Banasthali Vidyapith" payable at Banasthali/Jaipur to: Secretary - Banasthali Vidyapith, P.O. Banasthali Vidyapith-304022, Rajasthan, India; along with a request for application form clearly mentioning the course you wish to apply for, with your name at the reverse of the Bank Draft also. Prospectus and form can also be obtained in person upon payment of Rs.800/- in cash from: (i) Surya Mandir, Banasthali Vidyapith, Phone: 01438-228384, 305655, Mobile: +91-93528 79844. Separate form is to be filled for each programme. For B.Tech. (CSE/EC/EI/EE/IT/BT/CE/MT) one has to fill only one form but a separate form for B.Pharm.